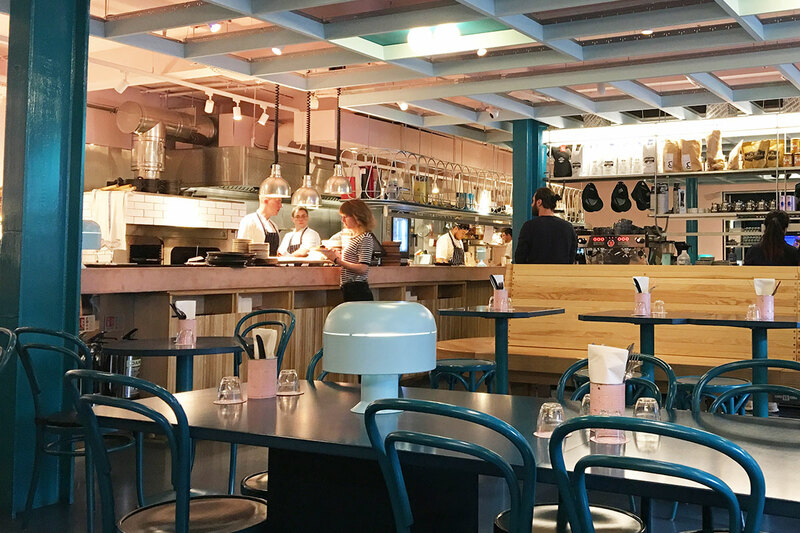 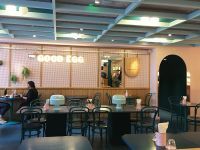 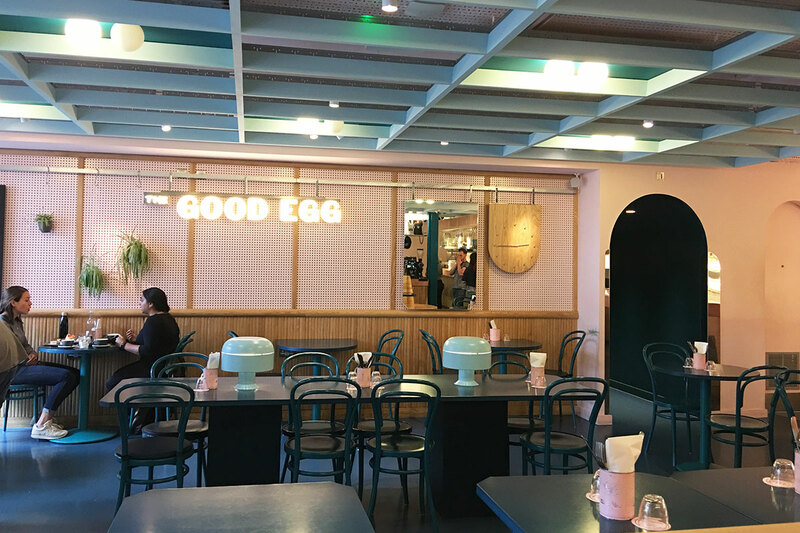 The Good Egg designers created a trendy space by combining pink ceiling and blue resin floor. 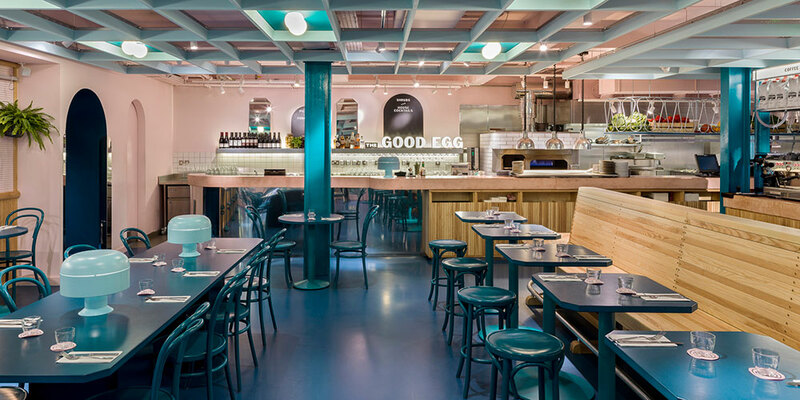 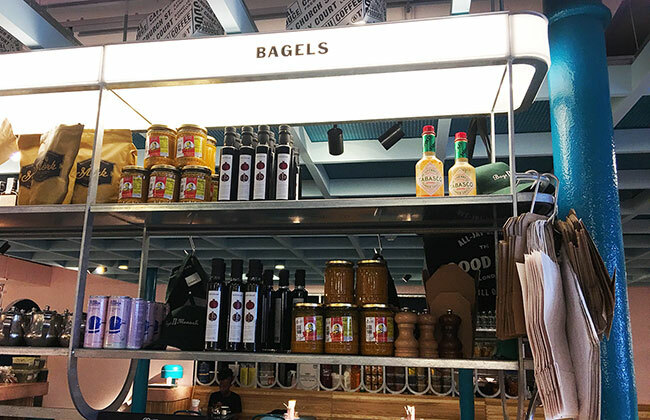 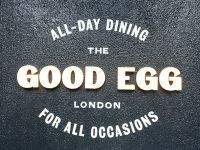 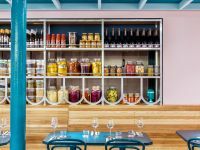 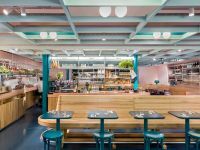 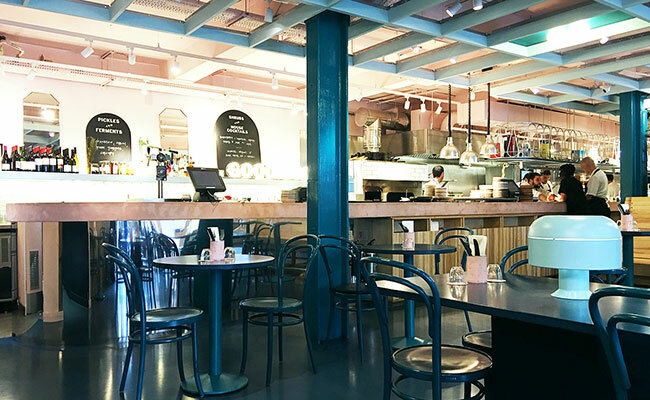 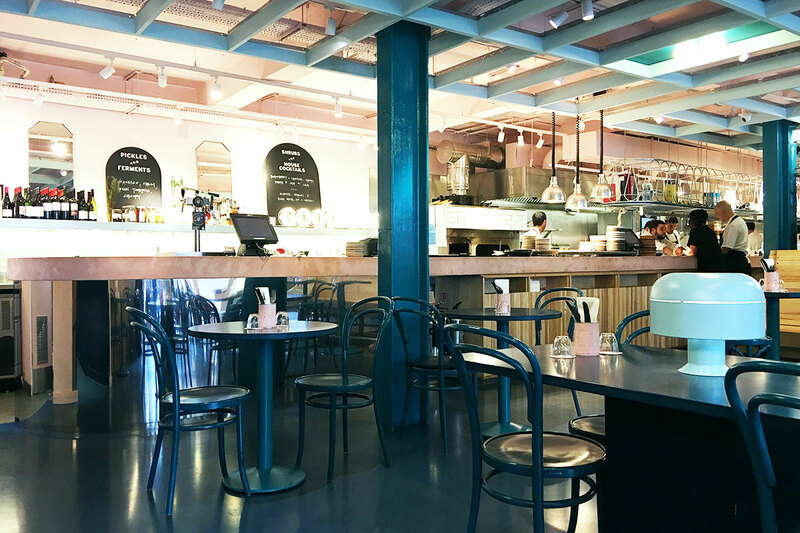 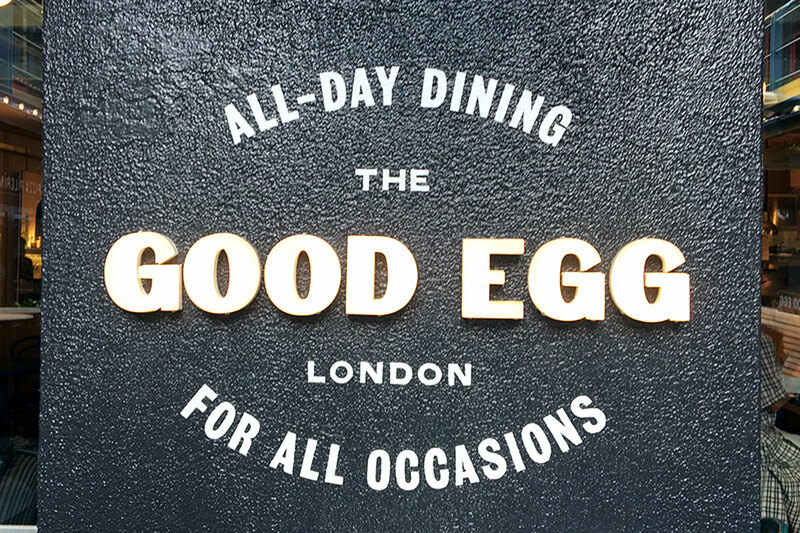 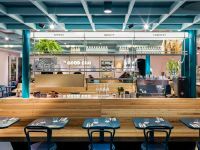 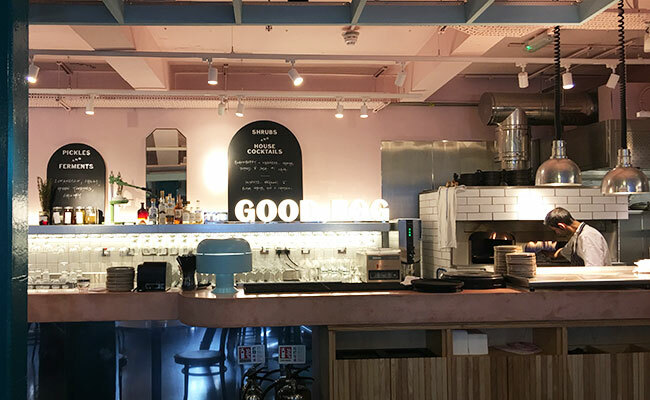 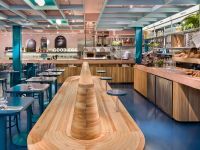 Set in a fashionable Kingly Court, Soho, The Good Egg second site is an all-day restaurant, bakery and a bar in one. 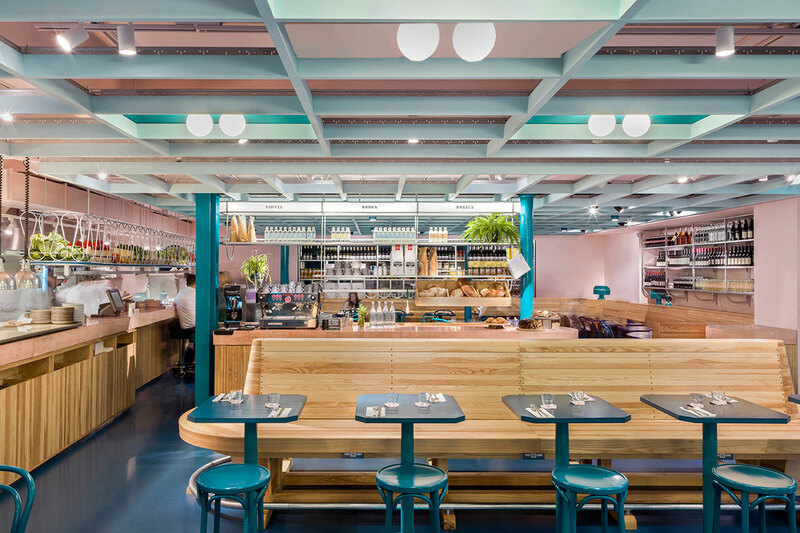 Casual restaurant interior is dominated by the bar and an open kitchen along the back wall. 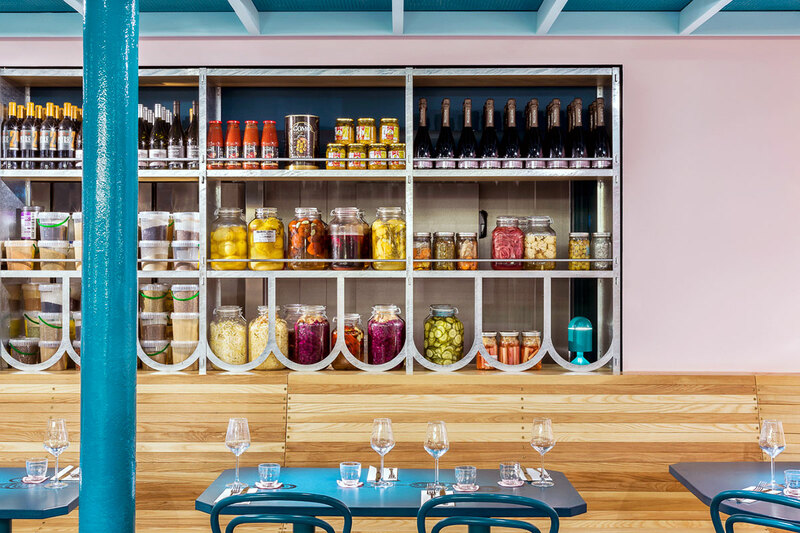 Painted bare brick walls are ideal backdrop for massive jars of pickled lemons, onions and beetroot. 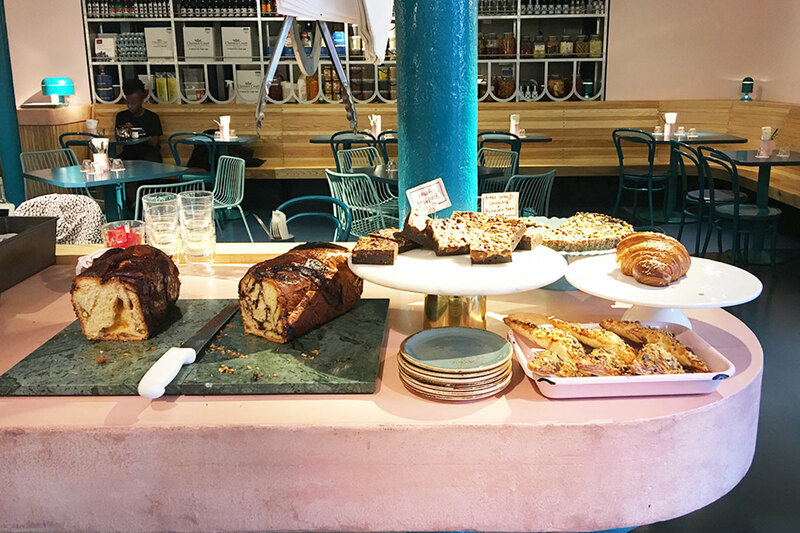 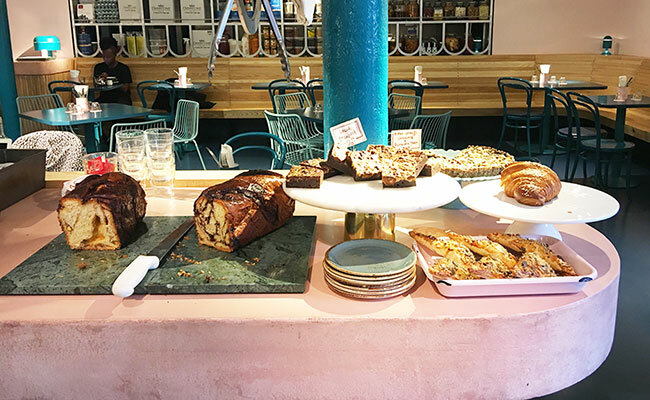 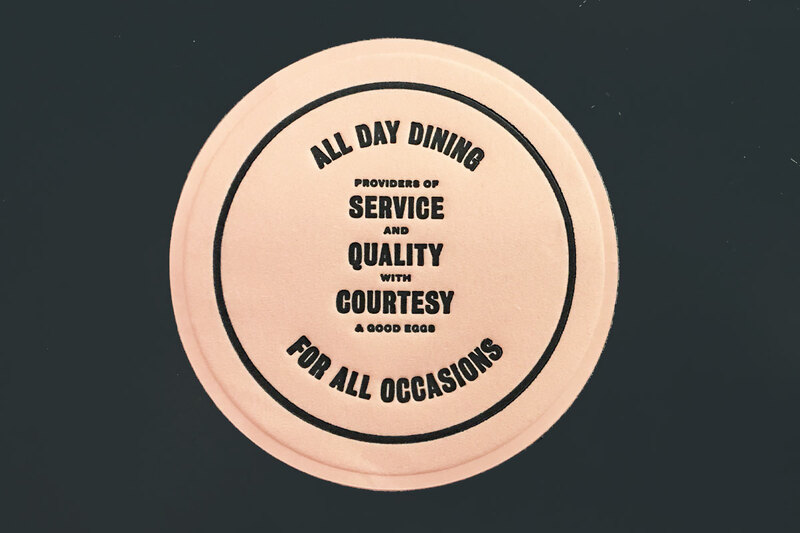 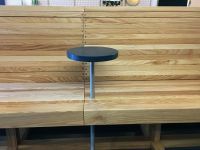 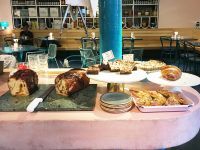 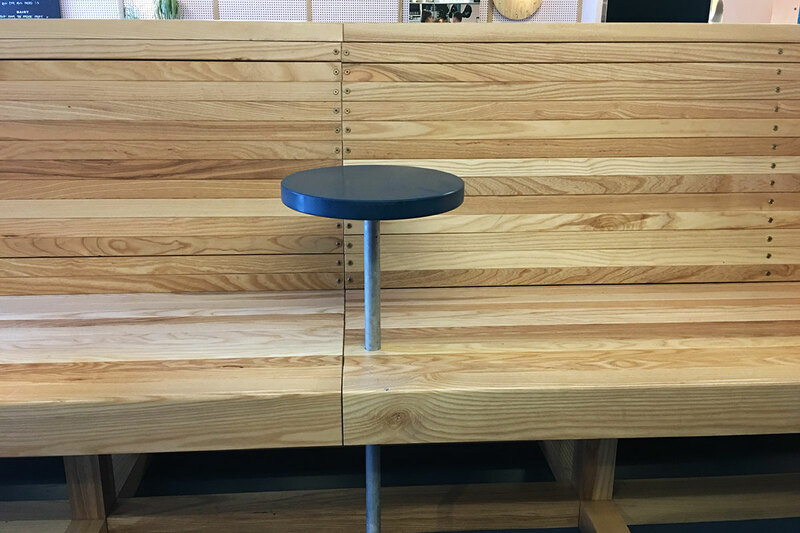 Restaurant and Café are segregated by centrally positioned quirky bench seating and waiter station featuring display of bakery goods and coffee. 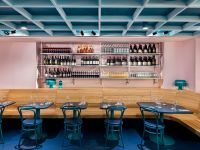 Pale pink walls and playful casually blue painted tables and chairs create welcoming atmosphere. 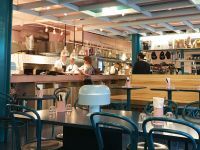 The open kitchen allows you to watch your food being prepared, impatiently awaiting the wonderful aroma of food that spills out the open door. 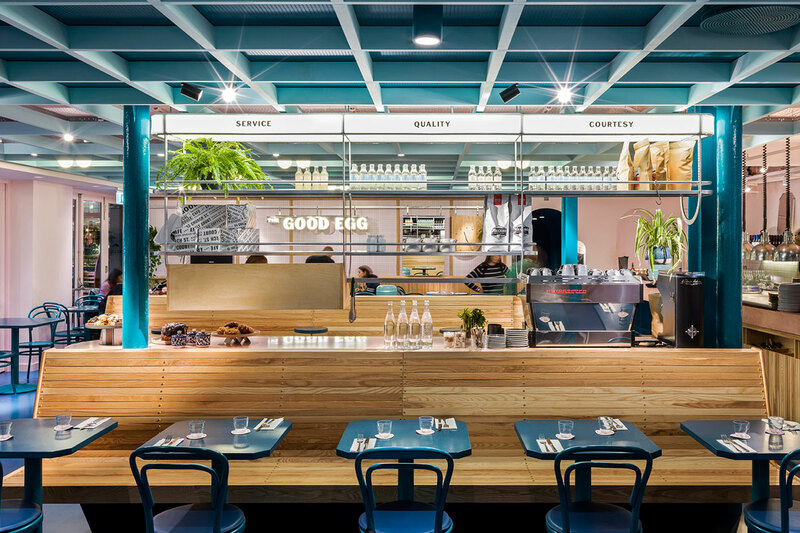 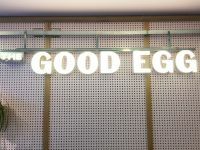 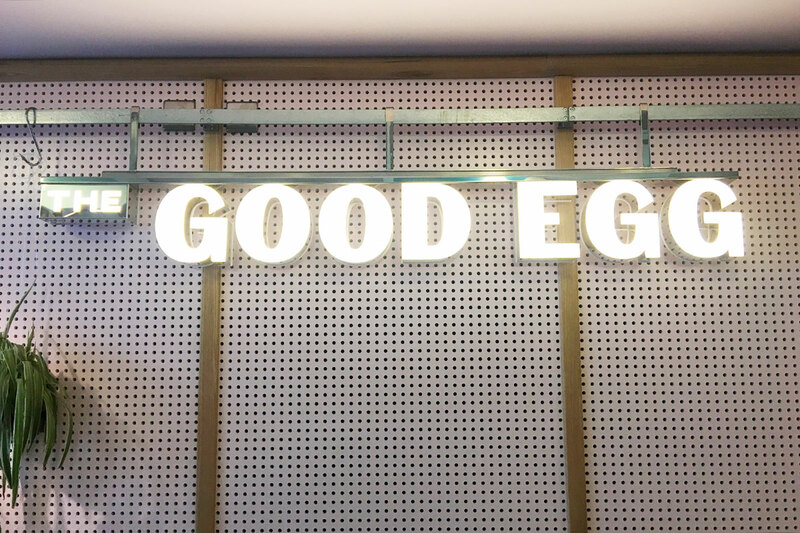 Modern and fun, The Good Egg Restaurant architects used metal gantry above the waiter station to makes up for the lack of storage. 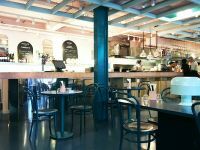 Although filled with ingredients for the chefs and waiters, there is the odd potted plant with delicate leaves hanging down. 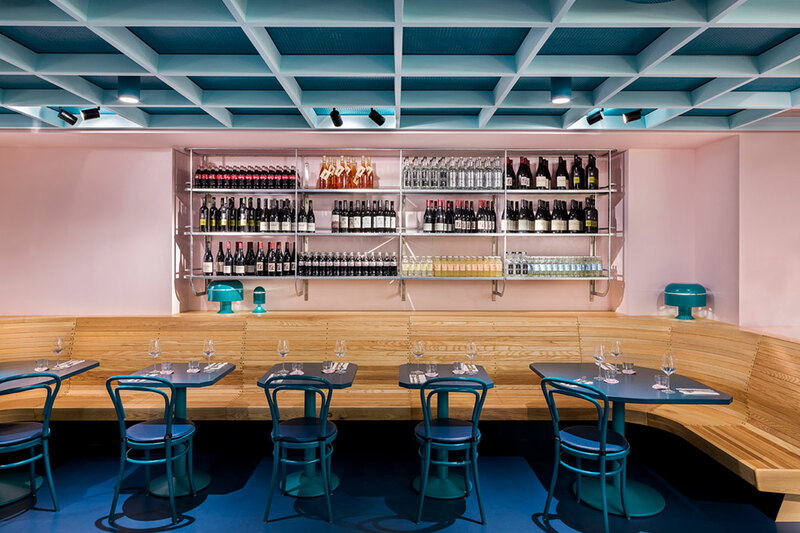 The pink conglomerate bar top sits over mirror bright stainless steel counter front. 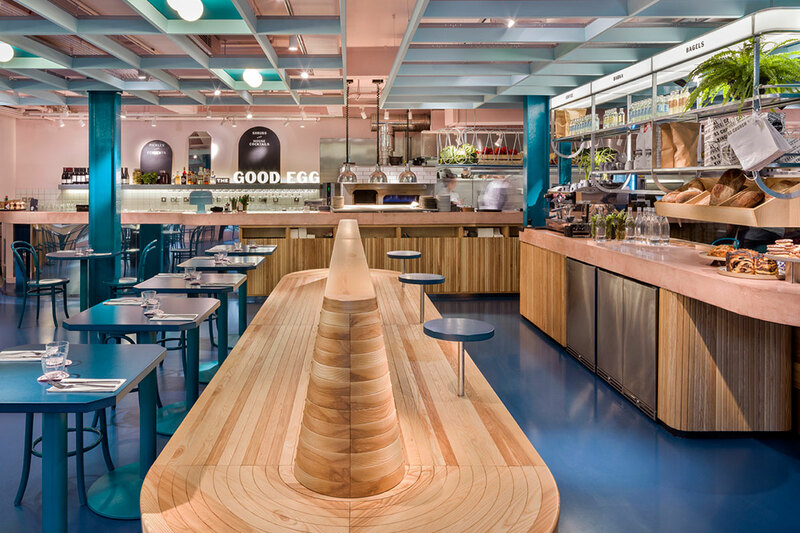 The contrast of the rustic pink stone and smooth sleek metal worked really well. 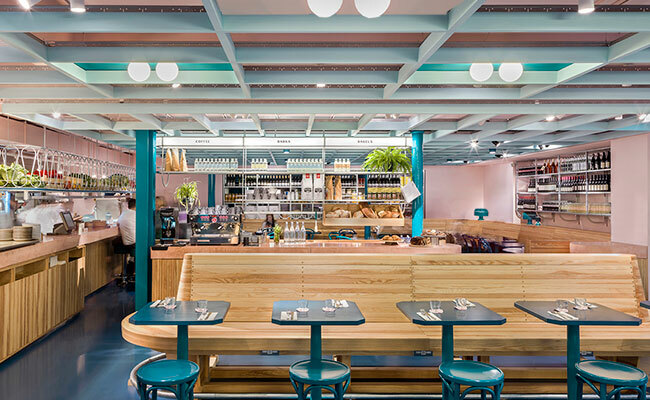 Split pale bamboo cladding lines the lower walls, along with feature pink painted pegboard and a long metal bar with suspended illuminated sign and plants creating an eclectic mix. 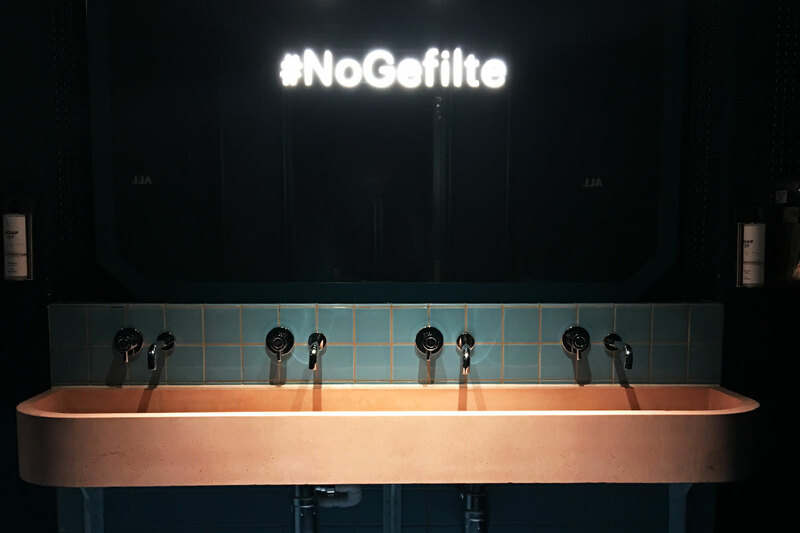 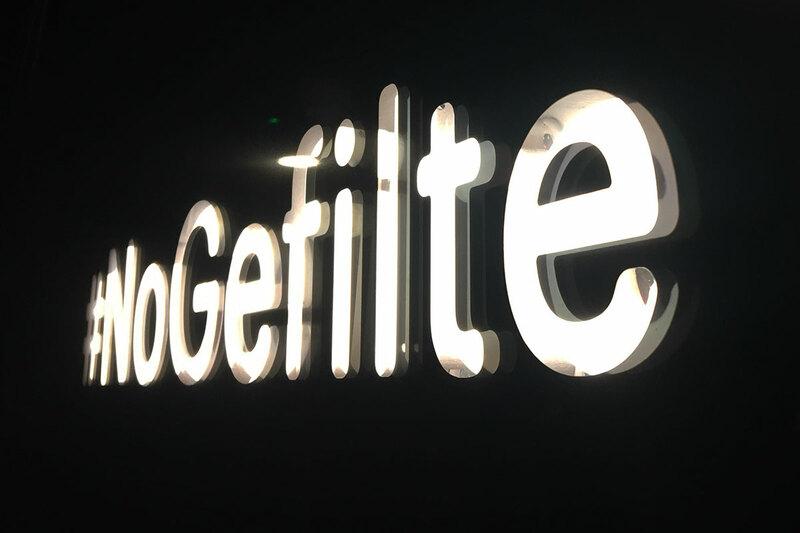 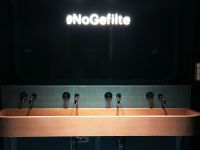 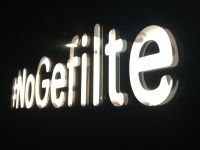 To finish, the restaurant architects have created dark moody toilets with pink stone basin and illuminated #NoGefilte cold cathode letters set behind the mirror. 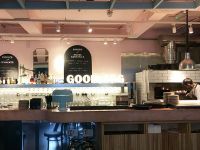 This place is a lot of fun but and the food is outstanding, dishing out the small plates of delicious taste bud sensation. 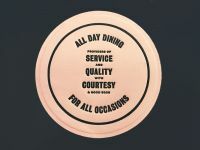 Even the bill came inside a mustachioed Bill Murray from younger days. 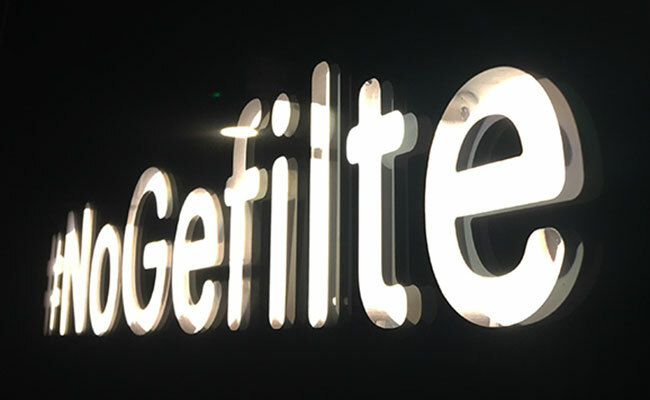 We’ll be back for more.